In this quick landscape exercise, I am using some of the same techniques used in my life paintings. There are only a few basic techniques in watercolour painting. The key is to master each technique and this only comes with practise. 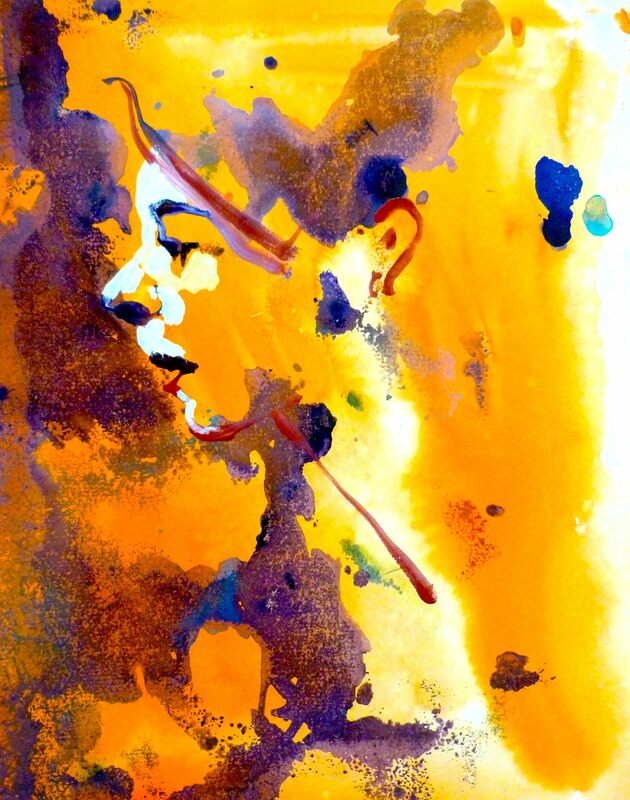 A friend and fellow artist sent me the beautiful gift of Schmincke Aquarelle Lasurorange translucent orange and so I thought I would try it out in this warm up exercise….and it is indeed a beauty. In this frame, I have suggested an horizon line and then wet the area above the horizon, leaving the paper beneath the horizon line completely dry. I now introduce some of the Schmincke Lasuroragne and allow it to bleed to the top of the paper. At the very top I have added a little Naples Yellow, which is a more opaque pigment. I love the way transparent pigments work next to opaque pigments…again an idea to play with. I now add some more juicy paint (mix of Violet and Crimson) into the wet area at the horizon line. Then I take a clean, wet brush and gently pull colour down into the dry area….note that I am leaving some areas of dry white paper next to the horizon line. This technique of using a clean, wet brush to pull out paint is possibly one of the best watercolour techniques….It helps to prevent muddiness! In this frame, using the violet and crimson mix, I indicate tree lines and field boundaries. Note that I am leaving a lot of dry white paper. I also bring some of the violet and crimson mix into the foreground for balance. It is also important to note, that I am allowing the paint in the sky to do its own thing at this point….I am not trying to manipulate the paint. I now introduce some of the Schmincke Lasurorange into the foreground….Remember all colour reflects on its surroundings. Here are swatches of the colours used in this image. Cotman series Dioxazine Violet, and Alizirin Crimon. Schminkcke Lasurorange and Winsor & Newton artists grade Naples Yellow. This entry was posted in Uncategorized and tagged cotman watercolours, janet weight reed artist, janet weight reed tutorials, mixing transparent and opaque, Schmincke watercolours, winsor & Newton watercolours, www.janetweightreed.co.uk on December 4, 2013 by janetweightreed10. Tutorial 2. The power of negative space. For this second tutorial, I am using a Calla Lily as my model. I have always loved its exquisite form, and have used it for many years as both symbolic and decorative imagery in my paintings. It is key to train the eye to observe both the subject and the negative space, that which surrounds the subject. Often we try so hard to make something happen…..to paint a perfect (in this case) calla lily, or solve an ongoing problem. When what we need to do is observe and record the negative space, which surrounds the subject, and voila…the answer is revealed. In Frame 1. Working on white paper, I have sketched the calla lilly using a neutral colour (yellow ochre) however, if you wish to use a pencil, brush, felt tip pen, that’s fine. Note that after sketching the form, I immediately begin to add colour into the surrounding area – the negative space. I am using a mix of burnt sienna and prussian blue. Frame 2. I continue to add the mix of Prussian Blue and Burnt sienna into the negative space, which automatically reveals the lily. Note that I am working on a dry surface. To manipulate the paint, I use one of the most important techniques in watercolour painting. With a clean, wet brush I pull the paint out to the edge of the paper. This gives an element of control, and helps to avoid muddiness….the enemy of all watercolour painters. Frame 3. As I pull out the colour with my clean, wet brush….I am able to bleed more colour into the wet background. I bleed in some violet and turquoise, and at the same time use a kitchen knife to scrape out some of the colour. This gives a sense of movement and breaks up the density of the negative space. Frame 4. In this image, using some of the same colour that is in the background, I begin to indicate the shadows. Very little pigment is used for this. The white paper, in this instance, becomes the whites in the image. In other words I leave areas that I want to stay white, completely dry. Frame 5. Now I begin to strengthen the shadows and build up the colour in the Lily. Remember, any area I want to keep completely white, I keep as dry white paper. 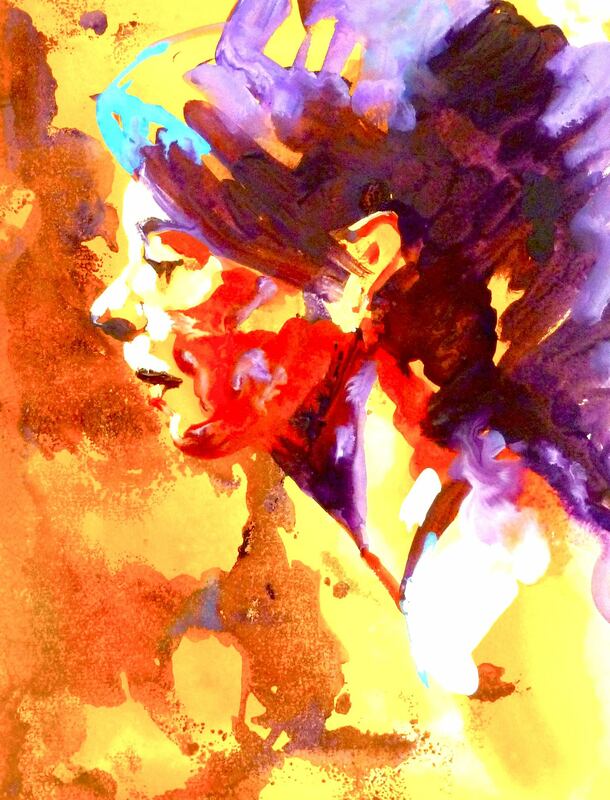 It is important to note, that I take the same colours I have used in the background to make up the shadows…..this is because, everything reflects upon everything else, and all things are connected. It will also help to give the image a sense of balance and harmony. Next week, I hope to show some one minute videos, which might help you with some of these techniques and also talk about my book The Apple Exercise which incorporates all the different elements which will be shown in these tutorials. For now wishing everyone a lovely weekend. This entry was posted in Uncategorized and tagged avoiding muddiness, balance and harmony, cotman watercolours, drama in painting, everything is interconnected, janet weight reed, negative space, symbolic decorative imagery, the apple exercise, watercolour calla lily, wins or & newton on November 8, 2013 by janetweightreed10.